If transporting in a SUV type vehicle, 35" tall rear door opening is needed. 2-compartments each hold 3.7 gallons. Cup clearance is 12" for tall glasses or pitchers. This unit should not be placed in direct sunlight and plugged directly into an 115 volt electric outlet. Refrigerant = R404A, Compressor 3/8 HP, Drive motor 2 @ 50 Watts ea. This machine is calibrated to work properly with the Frusheez mix we provide. to dispenser. Starting at room temp.product recycle time is approx 45 min. diet drinks or Country Time Lemonade. They are too sweet and will not work! 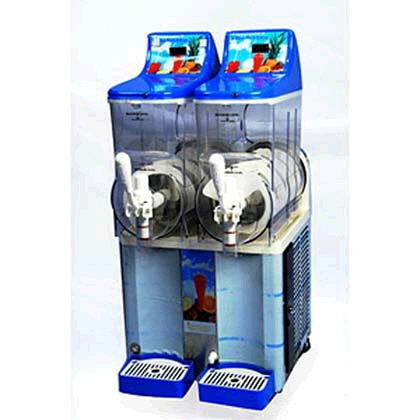 * Please call us for any questions on our dispenser 2 compartment frusheeze rentals in Ft. Wayne IN, Warsaw, Syracuse, Auburn, South Bend, Indianapolis IN.